Maitland, situated in the Hunter Valley and Newcastle region of NSW, is home to steam trains and legendary boxer Les Darcy. 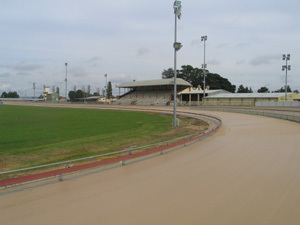 It also plays host to Maitland Greyhounds, which race each Thursday afternoon, with operations overseen by the NSW Greyhound Breeders, Owners and Trainers Association (NSW GBOTA). One of the most supported local racing TAB venues, Maitland is one of the highest performing sponsorship venues in the NSW GBOTA portfolio. Annually close to 100 local Clubs and Business support the Maitland Greyhounds, an effort which has previously seen the club a nominee for GRNSW Club of the Year. Situated on Showground land, the Maitland Greyhounds works with other parties such as Maitland Harness and the Horticultural Society to attract a range of secondary events such as Groovin The Moo.